Fall is officially here and so I am looking for natural decor ideas. 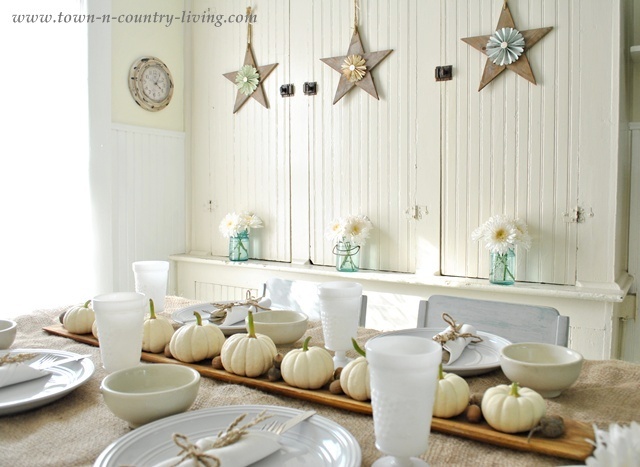 I love this mixture of white ironstone, milk glass, and white pumpkins. Definitely a table I would like to sit down to. 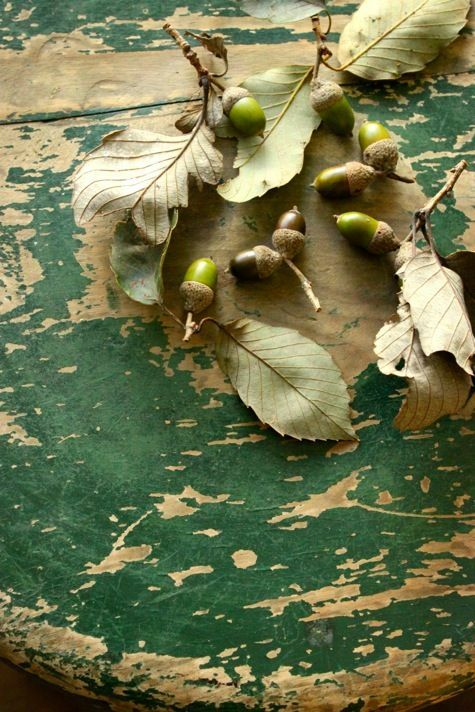 Even if your leaves haven't started to really change yet, some acorns and drying leaves on an old worn table make a perfect rustic display. 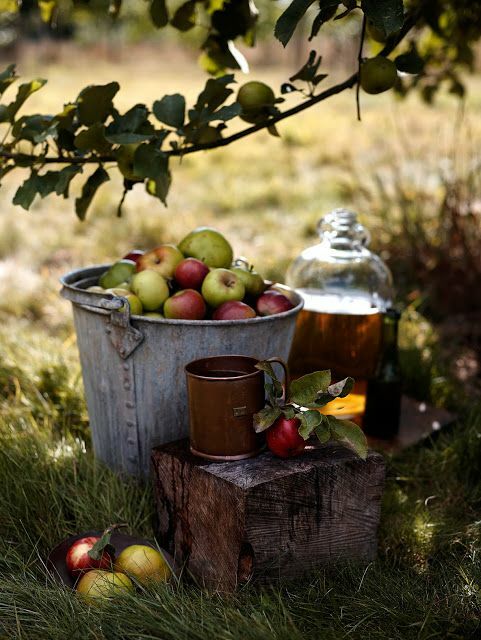 It's apple picking season and nothing says fall more than an old zinc bucket filled with the day's harvest. I wonder how long they will last before they are turned into pies and other treats. 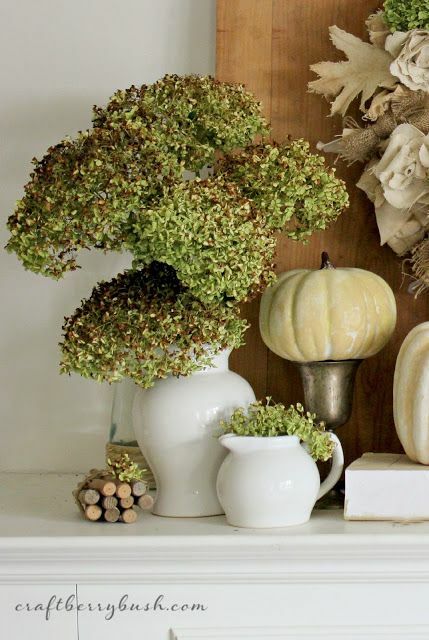 Dried flowers and some white pumpkins added to pitchers and vases make perfect mantle vignettes. A single perfect pumpkin can make just the right statement. And for a warm autumn welcome, a bittersweet wreath combined with pumpkins and gourds. I think what I like best about fall decorating is that much of what you use can be collected on your nature walks. I'm ready to get out there and start searching. I love the natural decor, too...unless the decor item is just soooo vintage, lovely, cool! So pretty and inspiring. I love fall! Laura, beautiful images. My favorite is the one with the apples in the bucket. 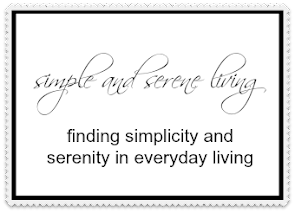 There is so much Fall inspiration in blogland. I love that apple vignette. love to gather natural elements for fall, thanks for the inspiration! I agree about things found in nature...the gathering is my favorite part. The more I see white pumpkins, the more I want some..next year I should grow some. 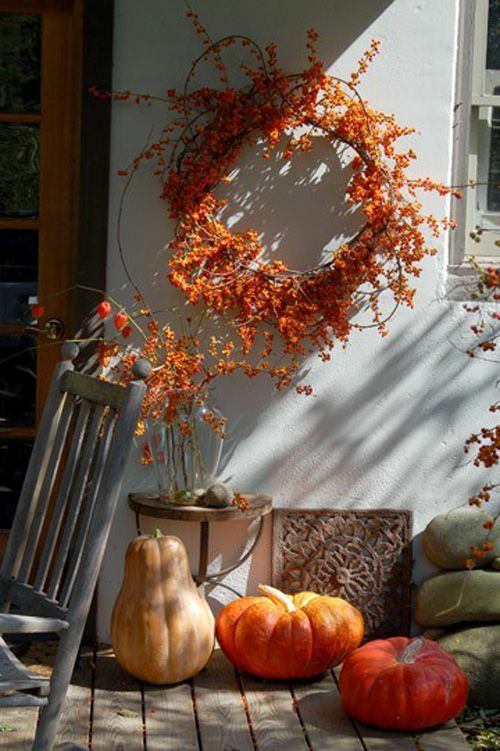 I love the white pumpkins too and the neutral decor. So pretty. Very pretty! Love the bittersweet wreath. 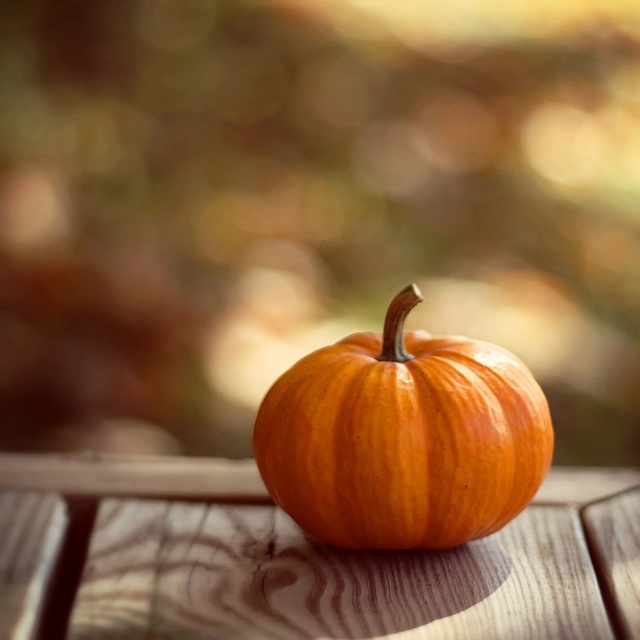 Apples and pumpkin are such a nice and natural way to decorate for fall. What a gorgeous post. Eye candy, for sure! Laure, these images are beautiful! Love using natural elements in decor. Now that I'm starting to settle in to the changing season.....baking an apple pie sounds good! I know I'm a bit late to the party (weeks late) but I had to comment on your beautiful photos. They have gotten me in the mood for fall decorating. Thanks for sharing.